When our friend Robin invited us over for dinner last night, I immediately offered to bring dessert. And of course, I was thinking about making something chocolaty. However, when I was meal planning earlier in the day, I came across a recipe for Strawberries with Cheesecake Cream that looked too good to pass up. As much as I love chocolate, this sounded like the perfect summer dessert. I wasn’t feeling the flavor combo in the original recipe (it calls for orange juice and orange liqueur), so I made a few changes. Regardless, this dessert was a winner! 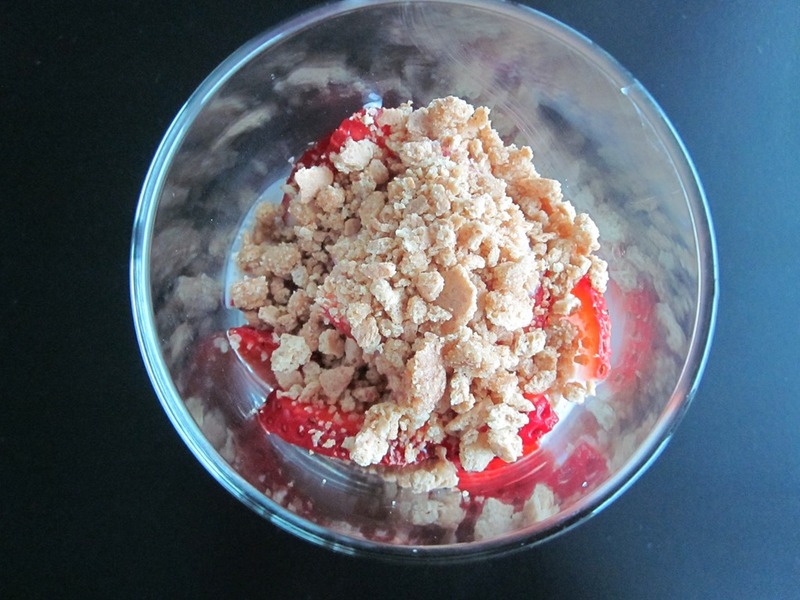 The cheesecake cream was lightly sweetened and had hints of vanilla, the strawberries were juicy and sweet, and the graham cracker crumble added the perfect crunch. Heat the oven to 350 degrees. Place graham crackers in a food processor and blend until crumbly. In a small bowl, combine butter and graham cracker crumble. Spread on an ungreased cookie sheet and bake for 5 minutes. In a large bowl, beat together the remaining ingredients, minus the strawberries, until smooth and creamy. 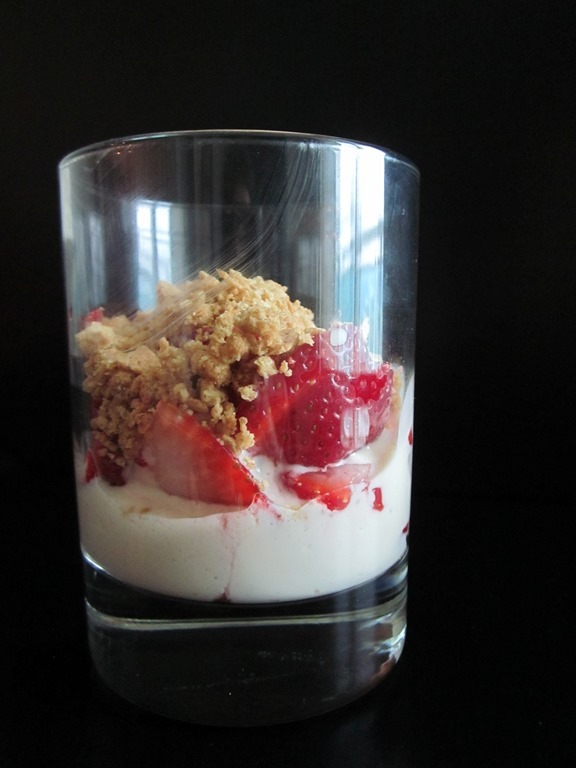 Divide the strawberries among 4 bowls/glasses, top each with about 1/4 cup of cream cheese mixture and finish off with graham cracker crumble. YUM. You don’t have to take my word for it though. Andy, Robin’s husband, asked for the recipe after his first bite. We all agreed that this was the way to go as far as summer desserts are concerned – light, simple, and delicious! So yeah, make this ASAP. Period. YUM- this looks so good! I love fruity desserts in the summer, especially strawberry cheesecake. Even something as simple as fresh berries with vanilla ice cream is enough to hit the spot…although a little bit of a crumble topping can’t hurt ;)! I have a really good recipe for a berry ice cream topping that I’ll have to dig up and send you! Come to Miami and we’ll celebrate! That looks so good! I used to be all about the chocolate desserts too but lately I like the fruity ones even more! i absolutely love these kind of dessert – simple and delicious. This looks soooooooooo good P. I have to throw my friend a baby shower, maybe I’ll make these since they are so easy… and it’ll save me time. You can add so many other fruits… a combo of all the berries would be so nice. looks delicious. This would make for a perfect mini dessert cup. And yes, any fruit would work! !